Best Water Technology Group (BWT) is Europe’s leading water technology company. BWT water partner network comprises the groups’s 2,700 employees and thousands of plumbers, planners, architects, hygiene experts, and strong Research & Development team. BWT “For You and Planet Blue” signifies the mission to take ecological, economical, and social responsibility to provide customers and partners with the best products, systems, technologies, and services in all areas of water treatment and at the same time, to make a valuable contribution to preserving the global resources of our blue planet. Supporting with BWT strong technical and R&D team, Triotirta as the sole agent of BWT for Indonesia for more than 20 years, is well-prepared to serve you with BWT Bewazone installation and service. Triotirta knows that Ozone Generator is not a simple technical products and requires strong technical support. Therefore, TriotirtaCare fully commits to accompany you with continuous after sales technical services. 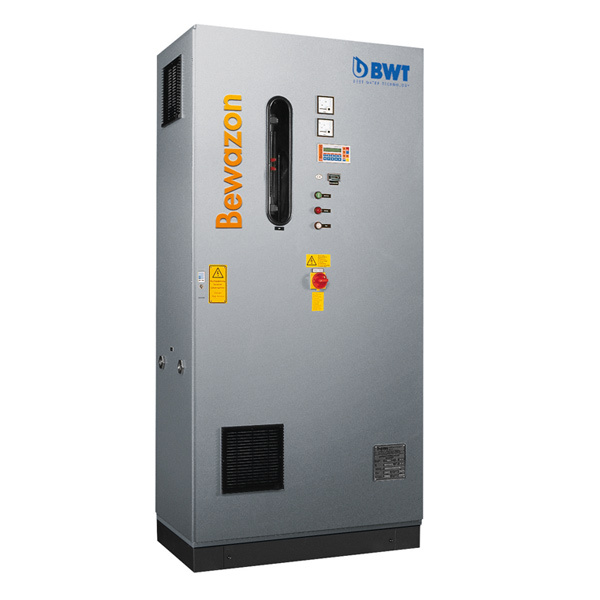 Contact TriotirtaCare to know more about BWT Bewazone – Ozone Generation Unit. Ozone (O3) – the tri-atomic modification of oxygen – is a powerful oxidant and disinfectant. Within its normal potential, it is far superior compared to other oxidants such as hydrogen peroxide and chlorine. Due to its oxidation power and its high reactivity, ozone can replace or suplement other oxidants in many application areas. Also due to its high reactivity, the ozone molecule is unstable and thus breaks down rapidly. In contrast to other oxidants, ozone cannot therefore be manufactured industrially, transported to the place where it is to be used and stored there. Ozone is generated locally from oxygen by an electrical discharge in ozone generators. In these units, a high voltage is applied to high-voltage electrodes separated by a dielectricum, generating a high alternating field between them. The resulting silent discharge converts oxygen (O2) into ozone (O3). BWT’s ozone generators, Bewazone, using pure oxygen as the process gas, are sized specifically for each project. In these generators, the ratio between ozone concentration or oxygen usage, power costs for ozone generation and investment costs are optimised so that oxidation process with ozone can be carried out economically and safe. Depending on the needs, these systems can be designed with suitable additional facilities for ozone generation in vacuum or at high pressure. Bewazone has been used widely in most bottled water manufacturers and several big-scale shrimp hatcheries in Indonesia, and is proven to deliver the expected disinfection result. Contact TriotirtaCare for Bewazone type selection fitted to your requirements.